View More In Reaching Aids. 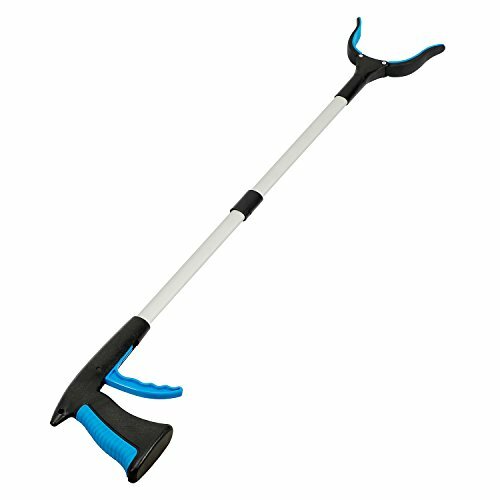 The grabber can work as a mobility aid for those that face mobility difficulties, such as the elderly or disabled. When the old man and the child take the high objects, they do not need to stand on the table. This grabber can grab the object you want. This grabber is a good help for sanitation workers. It does not need to bend down, it can easily grasp garbage and reduce labor intensity. The grabber is an essential tool for every household, and can be used to clean the trunk of the trunk without bending over, picking up leaves, scraps of paper, and drinking bottles from the garden. Picking up trash and litter. Picking up broken glass pieces. Reaching under furniture and beds. Retrieving items in hard to reach cabinets. Picking up daily things such as the newspaper. Plus many many more uses. 1. The plastic in the folding place is aligned with the hole in the aluminum alloy rod. 2. The aluminum alloy chuck is inserted into the hole in the plastic part. 3. Pull the handle switch, clamp the head to close, loosen the switch, clip the head to loosen. 1. ROTATING GRIP: Grip can rotate a full 360 degrees in 90 increments to be used both vertically and horizontally for easy to reach places like behind bed and desk. 2. FOLDABLE DESIGN: Adopt folding type design, shorten length, facilitate outdoor carry, also can collect in the cabinet, make the home puts more neat and beautiful. 3. EXTRA STRENGTH GRIPPER: Textured rubberized ends easy to grab 3-4 pounds of objects that don't fall off, it can be used to hold a red wine glass without leaving a clip. 4. CONTOURED HANDLE AND TRIGGER: Padded, anti-slip handle and contoured trigger matches the natural shape of your hand for comfortable, pain-free use. Especially important if using for extended periods of time. 5. LIGHT WEIGHT MATERIAL: Use lightweight aluminum alloy material, reduced labor intensity, wth arthritis and carpel tunnel syndrome and need products like this which are easy to use. If you have any questions about this product by Saymeto, contact us by completing and submitting the form below. If you are looking for a specif part number, please include it with your message.